Rebecca is a 1940 film about a naive young woman who marries a rich widower, moving to his gigantic mansion, where she finds the memory of the first wife maintaining a grip on her husband and the servants. Directed by Alfred Hitchcock. Written by Robert E. Sherwood and Joan Harrison, based on the novel by Daphne du Maurier. [to the 2nd Mrs. de Winter] Do you remember that cliff where you first saw me in Monte Carlo?... That was where I found out about her... She stood there laughing, her black hair blowing in the wind, and told me all about herself — everything. Things I'll never tell a living soul. I wanted to kill her. It would have been so easy. Remember the precipice? I frightened you, didn't I? You thought I was mad. Perhaps I was. Perhaps I am mad. It wouldn't make for sanity, would it, living with the devil. "I'll make a bargain with you," she said. "You'd look rather foolish trying to divorce me now after four days of marriage. So I'll play the part of a devoted wife, mistress of your precious Manderley. I'll make it the most famous showplace in England, if you like. Then people will visit us and envy us and say we're the luckiest, happiest, couple in the country. What a grand show it will be! What a triumph!" I should never have accepted her dirty bargain, but I did. I'd like to have your advice on how to live comfortably without hard work. [to the 2nd Mrs. de Winter] So this is what's been happening during my illness! Tennis lessons, my foot! I suppose I have to hand it to you for a fast worker. How did you manage it? Still waters certainly run deep. Tell me, have you been doing anything you shouldn't?... But you certainly have your work cut out as mistress of Manderley. To be perfectly frank with you, my dear, I can't see you doing it. You haven't the experience. You haven't the faintest idea of what it means to be a great lady. Of course, you know why he's marrying you, don't you? You haven't flattered yourself that he's in love with you? The fact is that empty house got on his nerves to such an extent, he nearly went off his head. He just couldn't go on living alone... Hmmph, Mrs. de Winter! Goodbye, my dear, and good luck. [to the 2nd Mrs. de Winter] Why don't you go? Why don't you leave Manderley? He doesn't need you. He's got his memories. He doesn't love you. He wants to be alone again with her. You've nothing to stay for. You've nothing to live for really, have you? Look down there. It's easy, isn't it? Why don't you? Why don't you? Go on. Go on. Don't be afraid! 2nd Mrs. de Winter: You know, I, I wish there could be an invention that bottled up a memory like perfume and it never faded, never got stale. Then, whenever I wanted to, I could uncork the bottle and, and live the memory all over again. Maxim de Winter: And what particular moment in your young life would you want to keep? 2nd Mrs. de Winter: Oh, all of them. All these last few days. I, I feel as though I've, I've collected a whole shelf full of bottles. Maxim de Winter: Sometimes, you know, those little bottles contain demons that have a way of popping out at you just as you're trying most desperately to forget. 2nd Mrs. de Winter: Our marriage is a success, isn't it? A great success? We're happy, aren't we? Terribly happy? If you don't think we are happy, it would be much better if you didn't pretend. I'll go away. Why don't you answer me? Maxim de Winter: How can I answer you when I don't know the answer myself? If you say we're happy, let's leave it at that. Happiness is something I know nothing about. Mrs. Danvers: You wouldn't think she'd been gone so long, would you? Sometimes, when I walk along the corridor, I fancy I hear her just behind me, that quick, light step. I couldn't mistake it anywhere, not only in this room, but in all the rooms in the house. I can almost hear it now. Do you think the dead come back and watch the living? 2nd Mrs. de Winter: I don't believe it. Mrs. Danvers: Sometimes I wonder if she doesn't come back here to Manderley to watch you and Mr. de Winter together. You look tired. Why don't you stay here and rest, and listen to the sea? It's so soothing. Listen to it. Listen. 2nd Mrs. de Winter: Why do you hate me? What have I done to you that you should ever hate me so? Mrs. Danvers: You tried to take her place. You let him marry you. I've seen his face, his eyes. They're the same as those first weeks after she died. I used to listen to him, walking up and down, up and down, all night long, night after night, thinking of her. Suffering torture because he lost her. 2nd Mrs. de Winter: I don't want to know. I don't want to know. 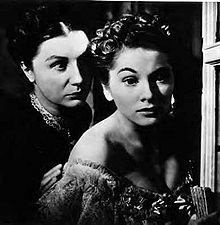 Mrs. Danvers: You thought you could be Mrs. de Winter, live in her house, walk in her steps, take the things that were hers. But she's too strong for you. You can't fight her. No one ever got the better of her. Never. Never. She was beaten in the end, but it wasn't a man. It wasn't a woman. It was the sea. Mrs. de Winter: Maxim, can't we start all over again? I don't ask that you should love me. I won't ask impossible things. I'll be your friend, your companion. I'll be happy with that. Maxim de Winter: You love me very much, don't you? But it's too late, my darling. We've lost our little chance at happiness. 2nd Mrs. de Winter: No, Maxim, no. Maxim de Winter: Yes. It's all over now. The thing has happened, the thing I've dreaded, day after day, night after night. 2nd Mrs. de Winter: Maxim, what are you trying to tell me? Maxim de Winter: Rebecca has won. Her shadow has been between us all the time, keeping us from one another. She knew that this would happen. 2nd Mrs. de Winter: How could we be close when I knew you were always thinking of Rebecca? How could I even ask you to love me when I knew you loved Rebecca still? Maxim de Winter: What are you talking about? What do you mean? 2nd Mrs. de Winter: Whenever you touched me, I knew you were comparing me with Rebecca. Whenever you looked at me or spoke to me, or walked with me in the garden, I knew you were thinking, "This I did with Rebecca, and this, and this." It's true, isn't it? Maxim de Winter: You thought I loved Rebecca? You thought that? I hated her! Oh, I was carried away by her, enchanted by her, as everyone was. And when I was married, I was told that I was the luckiest man in the world. She was so lovely, so accomplished, so amusing. "She's got the three things that really matter in a wife," everyone said: "breeding, brains, and beauty." And I believed them, completely. But I never had a moment's happiness with her. She was incapable of love or tenderness or decency. The most glamorous woman of all time!